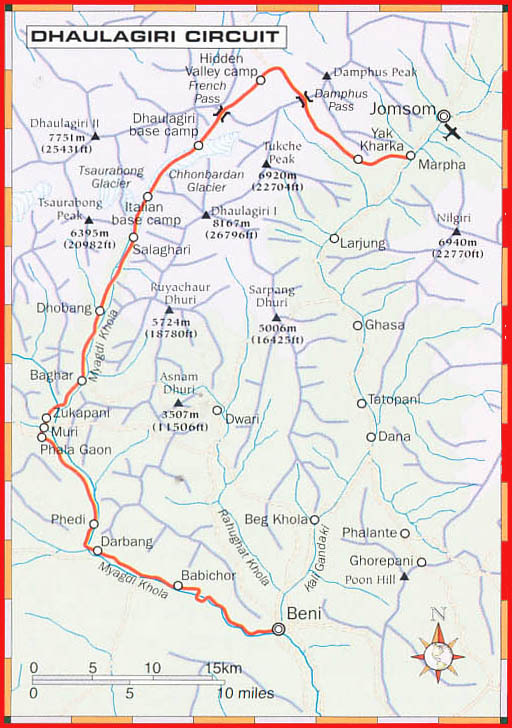 This challenging trek is truly adventurous for walker circling Dhaulagiri, the seventh highest mountain in the world. Dhaulagiri "white Mountain": towering in solitary splendor, this magnificent peak rises as a giant shoulder of shining ice and snow. Dhaulagiri is rarely visited and the valleys and villages surrounding it are unspoiled and unchanged .The trek witnesses kali Gandaki River, and north into the heart of the massif; from the base camp we come to the high point of our trek, the traverse of French Pass(5,360 m), the hidden Valley and Dhampus Pass (5182 m), a high level; route which brings us back to the upper Kali Gandaki Valley in Jomshom. Service includes: airport transfer in a private car, 4 nights in Kathmandu hotel (tourist class) on BB basis, 1 night in Pokhara hotel (tourist class) on BB, 16 days organized camping trek, 3 meals during trek, two men tent, dining tent, toilet tent, table, chair, all kitchen necessary utensils, national park fees, flight fare Pokhara-Jomsom-Ktm, one guide, one cook, helper, porters (minimum 2 porters for 1 member), Nepali staff, daily wages and meal and accommodation of guide and porter, one porter is allowed to carry maximum of 30 kg of total weight, insurance of guide & porter, farewell dinner, full day sightseeing with English speaking guide with all entrance fees. Service Excludes: lunch/dinner at Pokhara and Kathmandu, laundry, telephone calls, emergency evacuation if required, donation, tips and all personal nature expenses, sleeping bag. Note: Clients are suggested to give maximum of 12 Kg of personal luggage to the porter. Day 02	Around 9.30 AM in the morning there will be formalities of meeting the guide and brief information of the tour of the day. We go for discovering that extraordinary city. The program will be: Bhaktapur Durbar Square monuments with their wooden pagoda-temples, the Bodnath or Swayambhunath’s Buddhist sanctuaries and Pashupatinath hinduist one where the cremations occur, without talking about the many temples spread about along the crowded and busy streets of the antique city. Day 03	Bus form Kathmandu to - Beni (900m). Morning bus form Kathmandu to Beni with all the trekking equipment, staffs. Drive about 8 hours to reach Beni. Camp in a nice place. Day 04	Beni - Babichor (1000m). Leaving the Kali Gandaki valley, we go now alongside the Myagdi Khola crossing about 3 suspension bridges. At Tatopani, the sulfurous hot springs allow us to have bath and it may be for a long time. The trail is quite and no rush or crowd can be seen in this trekking area and from Babichor there is almost no more shops to be found. Camp in the garden near the village small Hindu temple. Ascent: 220m/ Descent 340m. Day 05	Babichor - Dharapani (1500m). We cross village Darbang, a very nice village where we find a post office and some shops. At Phedi, valley starts getting narrow and continue to walk a long and steep climb on a beautiful pine trees of covered hilltop. We reach to Dharapani, houses scattered on the hillsides and surrounded with terrace fields. Here, house roofs are covered with pumpkins and millet is crushed in mortars. Camp after a 5 hours walk. Ascent 730m/ Descent 140m. Day 06	Dharapani - Mudi (1940m). From the start of Dharapani we can expect to have an excellent panoramic views of the surrounding mountains, Gurja Himal (7193m), Dhaulagiri III (7715m), V (7618m). From the path which crosses Takum and Mattim, small villages, and moving ahead through a tower yellow, ochre, green terrace fields. A good balcony path goes on till Mudi. Camp after 6 hours of walk. Ascent:740m/ descent 400m. Day 07	Mudi - Boghara (2100m). We start walking on a little marked path through the paddy fields, we descent through the narrow valley and reach Jugapani. We again ascend about 900m in height above the river; a narrow and aerial path allows to have a view again of Dhaulagiri I. Myagdi Khola is sinking into a canyon with big waterfalls. At Boghara, the last village we cross, settlement is scattered: despite austere surroundings and can figure out the hard life of the living people around, there are about 250 inhabitants living around. We camp in the much frequented but really destitute school playground... 7 hours walk. Ascent 1000m/ Descent 450m. Day 08	Boghara - Dolang (2600m). The numerous up and down trail of today goes through a dense forest where we can see very typical and isolated huts of the last autochthones breeding buffaloes. We keep on moving, come across big waterfalls and finally reach to Dolang. Camp at Dolang. Sunset view of Dhaulagiri erases the fatigue of the long ascent trek and could be more relaxing. .6 hours walk. Ascent:500m. Day 09	Dolang - Pine trees camp (3200m). Morning sunrise on Dhaulagiri IV energizes us and we start our trail with a steep climb, sometimes slippery way down towards Konaban Khola, we forward through first river then we cross the Myagdi Khola on a small risky bridge. Humid and dense vegetation disappears for leaving place to high pines. Our camp is comparatively dry than what we pitched our previous camp. 7 hours walk. Ascent: 600m/ Descent 300m. Day 10	Italian Base Camp (3700m) ascent. Today we follow with a moraine crossing before entering again pines forest. After a steep climb to the foot of Manapati, we camp at west face foot, last vegetation line. The sunny spot is comfortable for acclimatization facing the views of beautiful panoramic mountains. 3 hours walk. Ascent: 500m / Descent 200m. Day 11	Dhaulagiri I Base Camp climbing (4700m). Glacier tongue crossing before entering a deep gorge, the old Chhonbardan glacier beds where we easily walk; it is rocky and very long but our eyes are looking at the Sita Chuchura (Blumlisalp at 6600m). The last moment seeing pass is facing Dhaulagiri north face. Camp after a 9 hours walk. Ascent: 1000m . the longest walk. And of course the toughest so far. Day 12	Rest day or walking around Base Camp with many walking routes. Day 14	Tukuche Base Camp - Thapa Peak (6012m) - Tukuche B. C. Today we try to assault for the Thapa Peak south face optional climbing (6012m), most awaited one and determined through the entire trek to conquer. Other members may rest or walking around. Day 15	Tukuche Base Camp Exploration of the surroundings. 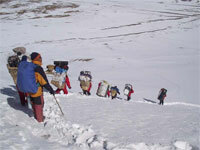 Today will be as an advantage day to climb Thapa Peak had the previous day’s weather not be perfect. If there are no weather problems, this day would also be used for second climbing or there are many possible peaks around to summit, or to a rest day for those who have already climbed Thapa Peak in a clear weather on the first day. Lots of options and possibilities to decide then and there. Day 16	Tukuche Base Camp - Thapa Pass - Yak Kharka (4850m). Leaving the place, the way starts with a gentle climb up to Thapa Pass or Dhampus Pass (5250m). A long hillside crossing walk is there till the 5092m point where we have a wonderful panoramic views over Annapurna range and Nilgiri massif. IF the weather gets poor one should be very cautious while crossing the pass, due to poor visibility it is advised to stick together and walk very patiently. Also, it would be a good idea to use the crampons. Camp at a high mountain pasture village: Yak Kharka after a 6 hours walk with. Ascent 150m/ Descent:1400m. Day 17	Yak Kharka - Marpha (2700m). A steep descent down on a small, narrow path, with that little and pleasant feeling of a bird gliding! Marpha, a very nice Tibetan culture village, is well known for its apple brandy. Camp after a 5h day. Descent: 1250m. Day 18	Marpha - Jomosom (2710m). Through a wide valley, we go up alongside the Kali Gandaki river, before arriving at Jomosom, the main village of that valley with many shops. Here is the small airport allowing going to lower valleys. 2 hours walk. Ascent: 150m. Day 19	Jomosom - Pokhara. Morning flight to Pokhara, transfer to hotel at Pokhara. Free day to relax around Phewa lake and stroll around small market of Pokhara. Day 21	Morning & afternoon free, in the evening farewell dinner is arranged. Day 22	Final departure, transfer to airport.